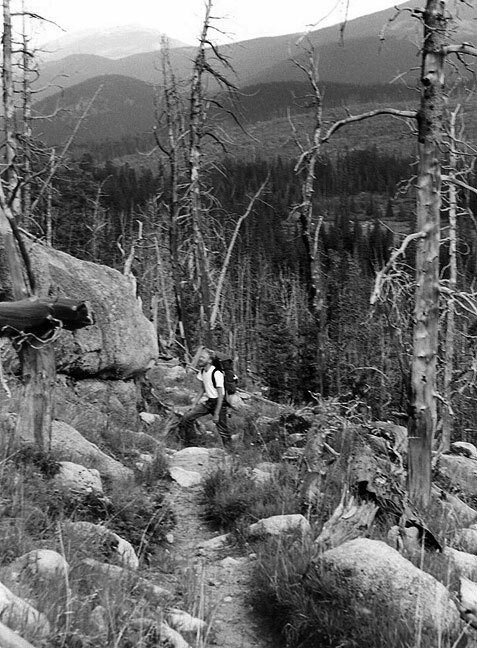 A long-time friend named David had, in 1989, hiked with his cousin in the Mount Evans Wilderness Area of central Colorado. 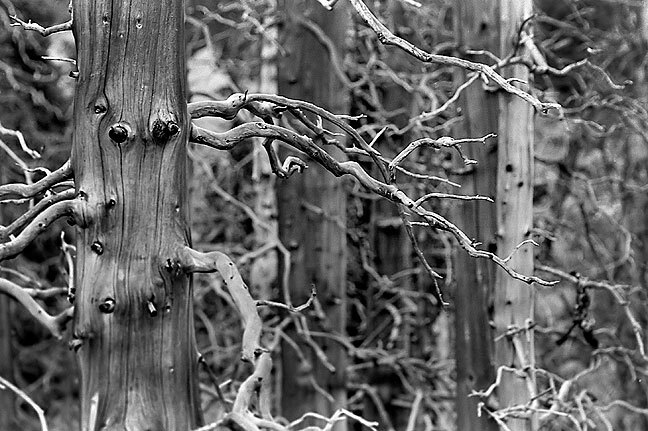 On that trip he had seen areas of forest that burned in the 1960s, leaving an eery landscape and fascinating weathering patterns on the trunks of the trees in the burned areas. 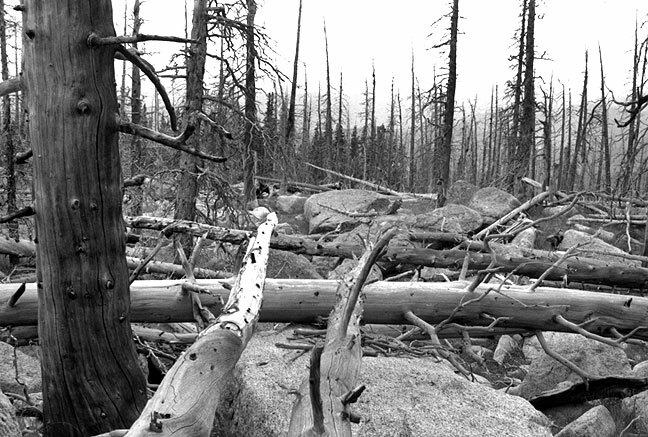 Burned pines reach for clouds on the Lincoln Lake Trail, Mount Evans Wilderness, Colorado. Wanting to return to photograph it more, David invited me. Between his cousin and brothers, we borrowed backpacking gear for me. We stayed with his brother and his family in Idaho Springs, Colorado for a couple of days to acclimate, then drove to the end of the access road west of the town of Evergreen. The only lens I carried on this trip was my 55mm f/2.8 Micro-Nikkor. 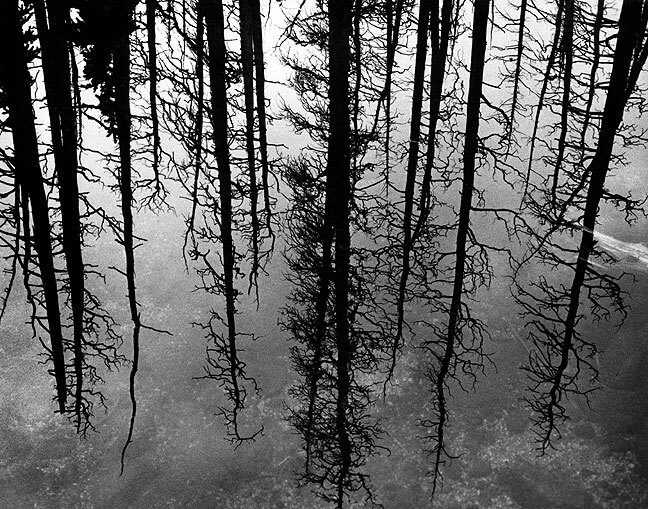 The forest is reflected in the waters of Lincoln Lake. 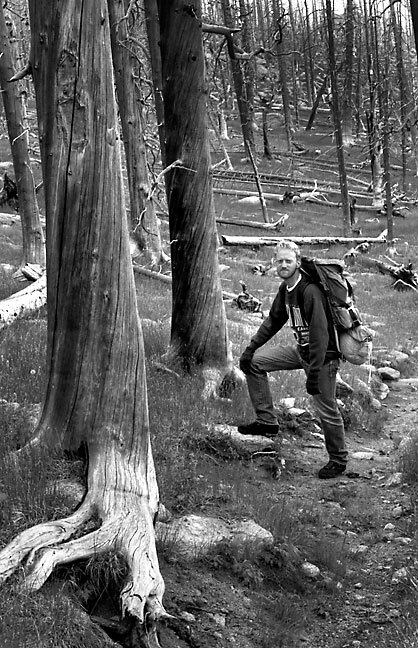 The author hikes the Lincoln Lake trail, which, at five miles and 3000 feet elevation gain, took about eight hours to hike with full packs. The hike through the wilderness ascended more than 3000 feet and was physically challenging. We saw many deer and elk, but fortunately no bears. Our camp site was on the south end of Lincoln Lake, a small, snow-fed body of clear water just below the tree line. We camped there two nights. On our second day, David decided he needed a bath, so he picked a small pond below the lake, which he dubbed the “idyllic glade,” and dove in. The water, fed by snow melt, was incredibly cold. After just a few minutes he got out and sunned himself until warm again. 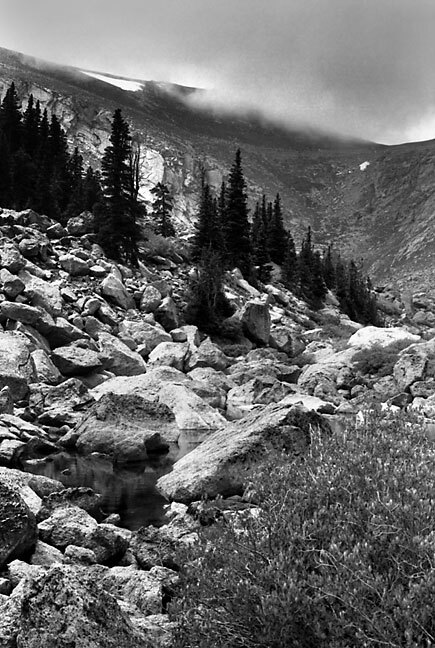 This view from Lincoln Lake looks up the col toward the Mount Evans highway. The white areas near the top are snow. This view of Lincoln Lake looks southeast from 1500 feet below the Mount Evans highway. 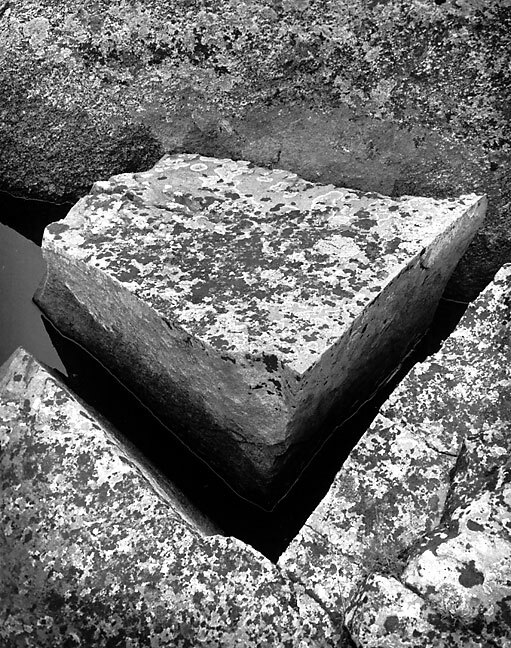 A granite block sits near the talus field on the northwest end of Lincoln Lake. Your host hikes on the Lincoln Lake Trail. The shouting must have worked, because the sun parted and he got a spectacular image that now hangs in his living room. 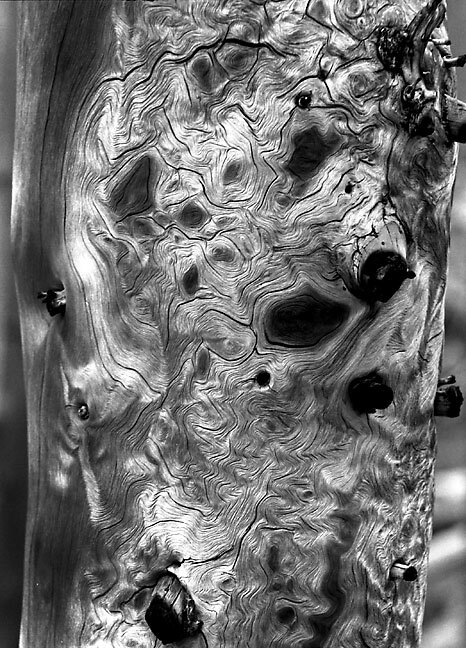 Burned and weathered trees create eery fingers in the Mount Evans Wilderness Area. 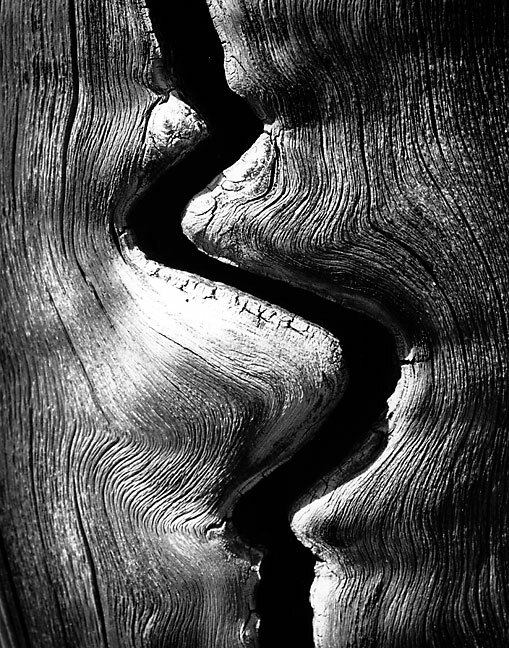 The crack is this burned tree trunk was exactly the kind of interesting feature David was hoping to photograph. 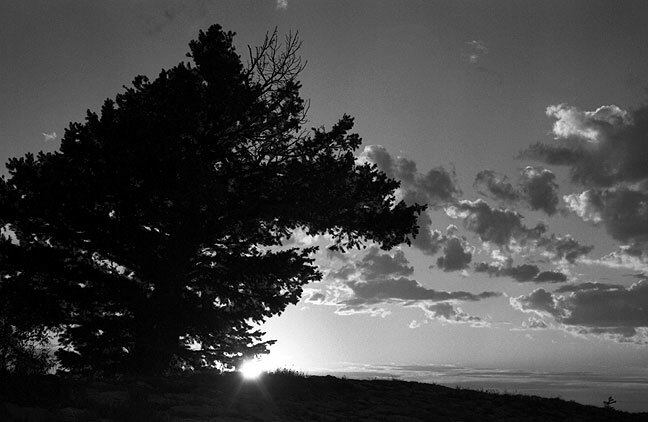 I photographed this New Mexico sunset at the end of our trip, in Villanueva. Once we were down from the trail, we drove south to a summer house owned by one of David’s relatives in Villanueva, New Mexico. Our route took us through Cerillos and Madrid, New Mexico, then up to Sandia Peak in time for sunset 5000 feet above Albuquerque. Tired from hiking and driving, once we arrived at the isolated thick, cool adobe house, I slept one of the deepest sleeps I have ever experienced. Boulder and clouds near Cerillos, New Mexico. Cliffs near Cerillos, New Mexico. Weathered cattle fence, central New Mexico. Catholic mission steeple, Cerrillos, New Mexico. Cholla cactus and eroded wall, Villanueva, New Mexico. Albuquerque, New Mexico just after sunset viewed from Sandia Peak 5000 feet above.